Hildah, the identified ‘Mother Theresa’ in Zimba community, started caring for the orphaned and vulnerable in her community in 1996. She was moved by compassion when she saw the needs in her own community. In the same year, George Snyman, co-founder of Hands at Work, visited Zimba and shared his heart for the poor with Hildah and a few other women in the community. According to Hildah, George’s visit brought so much hope and encouragement into the Care Worker's lives and inspired them to continue caring for the orphaned and vulnerable children around them. Hildah’s dream for Zimba is to see transformation; especially in the lives of the children who seem to have no hope for the future. Zimba's Care Workers have given themselves wholly to care for the vulnerable children in their community. The Care Workers in Zimba are very poor themselves, surviving by doing temporary odd jobs such as gardening and selling sugarcane. They lead very sacrificial lives in order to care for those who are struggling in their community. They are examples of true servants who are committed to caring and bringing hope to those around them. 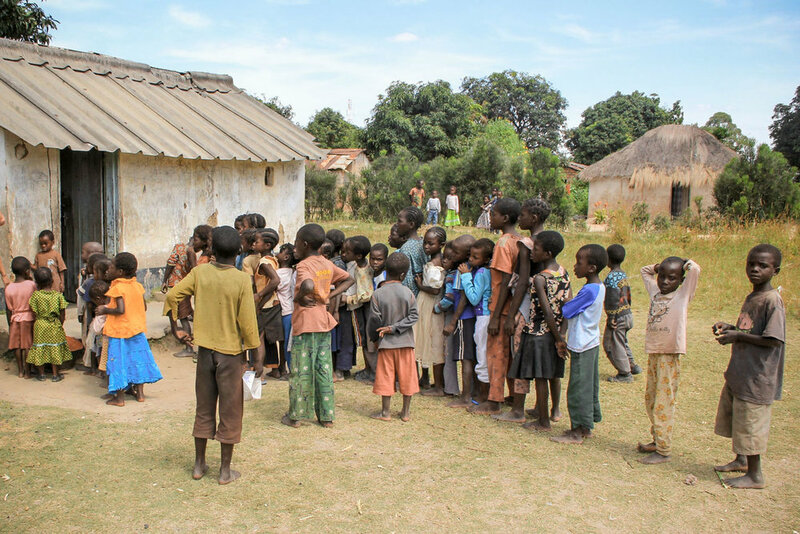 Hands at Work started a partnership with Kachema Musuma Community Based Organisation (CBO) and in 2012, began to provide services to the most vulnerable children. Care Workers also continued to visit children in their homes, bringing them parental care and love. Today, 150 of the most vulnerable children are receiving life-giving services in the form of one hot, nutritious meal every day, access to education and basic health care. There were 31 children from the CBO who successfully transitioned to the government school. Despite their own challenges, the Care Workers wanted the best for the children in their care and used money from their own fundraising efforts to purchase school materials the children needed. Today, these children are doing well in the government school and proudly wear their new school uniforms as they head to school each day. Their high scores on their entrance exams for the government school caught the attention of the District Education Board Secretary (DEBS) who wanted to see the school these children were coming from. DEBS commended the community school teachers for their commitment and thorough teaching, which encouraged the CBO and teachers greatly! Since the death of both his parents, Patrick* age 11, lives with his grandmother, Jacquiline. Patrick relies on his uncle for provision, as his grandmother is unable to work due to illness. When Care Worker Hildah found Patrick, he was lonely and quiet, but upon being visited and encouraged, Patrick now plays with his friends at the CBO and opens up to others. Despite the many challenges Patrick faces, Hildah is working hard to ensure he finishes school. The Hands at Work office in Kitwe currently supports seven Community Based Organisations, which exist to care for the most vulnerable in their communities. The office provides training, networking, and encouragement to those Community Based Organisations like Kachema Musuma. It also gives administrative support, including helping with funding proposals, monitoring and evaluation, bookkeeping and reporting to donors. Thank you Sunset Church Team for continually building deeper relationships with the children and the Care Workers in the community of Zimba, Zambia, and faithfully giving your time to invest into the community. 150 of the most vulnerable children in Zimba receive a daily meal, access to education and access to basic health care. A bore hole that is used to collect water for cooking and drinking.